Optimum Design Associates Senior Designer Scott Nance presents a 45 minute seminar on PCB design best practices for Switching Power Supplies. Originally presented at PCB West 2013, Scott's seminar has been viewed thousands of times. Welcome. Welcome everyone to PCB West 2013, Session 9, Switching Power Supplies. I'm your speaker. My name is Scott Nance. 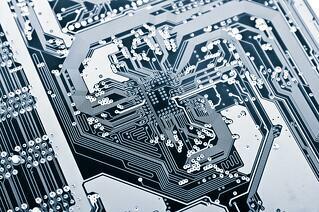 I'm a senior printed circuit designer at Optimum Design Associates. I've been a PCB designer in the service bureau industry for 30 years. I'd like to point out that, I'm not an electrical engineer nor a power supply designer. So this presentation is from my perspective, and that is that of a printed circuit designer. The reason for this presentation, I think, is simple. Switching power supplies and their layouts are everywhere. We see them in simple designs, tough designs, cheap consumer products, in your high-end phones. We see them throughout our computer supplying the power, and all throughout the computer at point-of-loads. That's the reason for the presentation. The reason that I'm here is that it was suggested by my boss, that we each take an article to write and mine was switching power supplies. I invite you to look at some other articles that were written by other designers from Optimum Design. You can find them at designinthetrenches.com, and they are covering topics like DDR timing, rational silk screen, Valor NPI, ODB++, and several others. You can see abstracts of these articles at designinthetrenches.com. We see that there's tons of available information about switching power supplies for the electrical engineer, volumes about magnetics and power loss, but there's not as much good information for the PCB layout professional. I think this presentation might help clear up some of the confusions that PCB designers have when it comes time for us switching power supply. We need to be able to identify it, and be able to lay it out so that each layout acts and it works as the manufacturer intended. I intend to briefly tell the history of switching power supplies - we won't spend too much time there - and then explain how they work. I'm going to provide some specific layout techniques and examples, some dos and don'ts. All this is just meant to provide the layout professional with enough information that he becomes empowered to become a better member of his design team. Let's begin. The agenda, first of all, switching power supplies; what are they, what do they look like, how do we identify them, how do they work? And then, we'll get into the PCB layout and that will be probably more fun. We'll get to that as soon as we can. And then, if we have time we have some power supply basics review. At any time, if anyone has any questions or anything's unclear, please feel free to ask questions and we'll see if we can get to them in the time allotted. So again, switching power supply history, this is going to be a short just recap on where they've been. Not where they're going, but just a short where they have been, where they came from. And then, we're going to go over some supply types and topologies so you can identify them. As a PCB layout professional, it might not be as important to know these things because most of these decisions have been made before they ever get into layout. The engineers already decided all the parameters for the switching power supply. We'll get more into the meat of it when we get down in the switching power supply circuitry. A little bit of the history. The principles were known in the 1930s. They were used on condensers, and arc welders, and things of that nature. IBM used it in their 704 mainframe and, of course, it was giant and not as efficient as the switchers that we see today. NASA used them. Telstar satellite is a good example. And then, the famous one is the Apple II personal computer because the switching power supply was introduced and actually made the computer small enough and light enough that it could be used in the home. There's lots of people that want to take credit for the popularity of the switching power supply. Apple comes to mind. Rod Holt was the engineer that introduced it in the Apple II. He got a lot of credit, which is due, but he did not invent the switching power supply. He only applied it to the home computer. What really should be credited with the explosion of popularity of switching power supplies are innovations in the semiconductor industry, which are going to be the controller chips that control the switching power supply and make them efficient. The other thing was, a power switch was needed to be able to quickly switch high currents, and the vertical metal oxide semiconductor power transistor enabled this. That's a fab term for vertical metal oxide semiconductor. It's the fab process for the chip, and it allowed for the quick switching. This was important for consumer products because, at the time, bipolar transistors were used for a while and they worked very well for high power applications, but they didn't switch - in the older days - nowhere near switch fast enough. What happened was the switching frequency wasn't above the audible hearing range of humans, so we heard things like squeals in TVs and things like that. Now the frequencies are much higher, and they're way more efficient because of that. So a little more history. These switching power supplies used to be called switch-mode power supplies. Motorola started enforcing their trademark, so they no longer are called that. They're called variations, they're often called switched-mode, switching-mode, or SMPS. I like the universal term switcher, because it applies to all of them, and I'll be using that term from this point forward. So when you think of a switching power supply-- if you're shopping for a switching power supply, what comes to mind is the computer main supply. It's actually more than a switching power supply and I'll show you in a minute but we call that a power supply unit. And that's what sources the mains voltage, the 110, and supplies all the voltages through the computer that you need. Additional regulation is happening at the controller, at the graphics card, and any other place that's stepping down the voltages from the main power supply. And we call those regulators or point-of-load. That's a little example of a little linear, ball grid array point-of-load regulator. So here's some examples. It's just showing the pictures of the vast difference, and maybe adding to the confusion of what is a switching power supply. The computer main power supply, a cell phone charger, an adjustable laboratory grade switching power supply, the linear ball grid array, which looks benign but really that one is quite exotic. An off-the-shelf module that you could use for applications that would work for off-the-shelf. That's car audio 800 watt power amplifier. Here's a block diagram of the computer PSU that I was talking about. As you can see, the first stages of them are really preparing the voltages for the switching power supply. A fused EMI filter rectification. If you know about power supplies, after rectification it becomes a DC voltage. The switching power supply is not really converting AC into DC. It's taking a DC voltage and I'll show you, it's actually converting it to an AC and then back to a DC for its output voltage for the purpose of efficiency. In this picture right here, after the rectifier I have a PFC circuit - and that is in some higher end PSUs - and that stands for power factor correction. There's two types. There's a passive and an active. If it's an active power factor corrector circuit, it's actually another switching power supply in line, preparing the voltage before the main power supply. Your common DC voltages that you would see, your standby voltages, your plus 12, your plus 5, plus 3.3, sometimes minus 12 and minus 5. We're not going to be talking about the PSU any more, just the switching power supply sections. By definition a switching power supply uses a power switch, magnetics, filter caps, and a rectifier to transfer energy, and that's from an input to an output source providing a regulated voltage. It works by rapidly turning that power switch on and off. That output voltage is calculated by what the input voltage to the switcher is and the duty cycle. The duty cycle is the proportion of time that that switches on versus off. During the on stage - they call it saturation mode - it's an efficient stage-- it's negligible voltage drop across it. In the off-state it's cut off, and it has no current going across it. So the power switch stays in these two states for some of the time, and those are very efficient states, and so during these times they dissipate very little power. This is the theory behind the switching power supply. And of course efficiency's usually the reason that you're using a switching power supply. Linear regulators are typically in the 60%, and switching power supplies are regularly in the 90%, and they're never 100%, but they can be 98. Higher efficiency of course means lower power drain on the input source, longer life for your batteries, lower heat buildup, all the things we need for our small modern day electronic devices. So comparing them to the predecessors which are linear regulators, switchers don't require the large, heavy, low frequency transformers that you would have seen in maybe the Apple I. Before the Apple II, they were large transformers. Switchers don't require these but they do require high frequency filtering. And these are done with a lot smaller components. The filtering is done with an LC circuit. It's going to be with a conductor and a cap as opposed to a large transformer. These aren't dissipating as much heat and so we see a higher efficiency by doing this. It also allows us to miniaturize and in conjunction with a higher power efficiency, it gives them a huge advantage over the linear regulators. The disadvantage of the switcher is they can be demanding in layout. Even when they are laid out correctly, because of the fast switching and because of the high current, they're noisy. They can radiate noise and so we have to be aware of that. We have to be aware of where this noise is coming from. There are two main types of switching power supplies. there's isolated and non-isolated. What these mean is if there's a transformer in the middle of the switching power supply. Typically you're going to need a transformer isolated switching power supply when the voltages are higher and this is for a safety reason. So anything above 42.5 volts-- this is pretty much a world wide standard, but here I'm showing UL requirements require this as well. Again, this is for safety. But if you don't need it-- so the lower voltages ones can be extremely small and many of the power components can be on the same chip as the control circuitry. That's why we find modules that have very few external components. Here is three of the common non-isolateds. These would be the smaller lower voltages. They're called buck, boost, and buck-boost, and they are identified by your input and output voltage requirements. The step down regulator is called a buck, the input voltage is going to be higher than the output. The boost, obviously the output is going to be higher than the input, and the buck-boost is going to be polarity inverting. Sometimes it's called polarity inverting, and - not as common - it's called a non-isolated flyback. Sometimes, by mistake, they're called a flyback but without the transformer they're not flyback. You would have to call it a non-isolated flyback. This is the simplest circuit. This is the step down regulator, the buck converter. The first thing we will do is identify all the key power components. The filter capacitors are identified as Cin and Cout. The power switch here is U-1. That's also the function of a series pass element. L-1 is the magnetic element - in this case an inductor. And then D-1 is the output rectifier, and in this case that's a Shockley diode, trying to keep the forward voltage drop low. Then you see there's three different topologies, but they're really created by just rearranging the switch, the rectifier, and the inductor. By these arrangements, they're slightly different but what's happening is that the energy's being recovered from a magnetic element differently. We're getting a boost up in voltage with the boost, and a polarity inverting by just rearranging the three components. And then big word asynchronous versus synchronous. Synchronous is often called an ultra-efficient switching power supply and I mentioned forward voltage drop of the rectifier. In an efficient switching power supply a lot of the time half of the losses or even over half the losses are attributed to that rectifier. It's being replaced by another MOSFET. Sometimes confusing in layout, the two are doing two different things but both of them had their own critical function. The control lines that are controlling the two are often called top gate and bottom gate. They're called top-fed and bottom-fed. One of them again the series pass element, the other one's going to be the output rectification. They're also called upper and lower sometimes. But you will see these inspections. They'll be called synchronous or ultra-efficient. And then interleaved and multi-phased. Interleaving is copying the series pass element along with the magnetics and what this does is it lowers the current stresses on these devices. You're able to share the input and the output filter caps, and by doing this you're actually able to reduce the size of the output filter cap. Again, more efficient and in this case it's multi-phased, you can tell by the control lines. What that does is, it actually reduces noise and increases the efficiency all at once. You are going to see this particular one doing things like supplying the core voltage of a microprocessor. These are the isolated topologies. These are going to be typically for the higher voltages. There's six common ones that identified here but they're inventing ones all the time for different applications. I'm showing some specific or some common applications, but the reality is that, any of these topologies will work in any application. They just have different characteristics that make them more suited for a specific application. The flyback is the one that I said earlier was in the TV high voltage. That's typically where you see the flyback or some cheaper computer power supplies. The forward would be the higher end computer PSUs. Two switch forwards, again just for higher power. You can see the power typically going up in range because each one of these topologies is better suited for that range. Any topology can be interleaved. You saw they weigh up to 1,000 watts. When they're going up to 10,000 watts, that's typically the full bridge that's being interleaved. You can interleave dozens of times. There's multiple switches and multiple inductors. These things can look very complex, but the switching principles are the same as the simple ones. I like showing the simple schematics, because what we learn here is just replicated on some of these more complex ones. The isolated topologies, I'm showing the flyback and the forward. These don't look too much different, but what they're doing really-- the flyback is derived from the previous-- I showed you the buck boost, the polarity inverting. Really all it's happening is, the magnetic element is split, coupled, and wrapped around forming a transformer. So that's the isolation but in reality it is-- that's why it's sometimes called a flyback when it's non-isolated. The forward converter is a change from the buck converter. All the other isolated topologies are really derivations of the forward converter. More switches, higher power, more efficient at that power. The last two would be the half bridge and the full bridge. This wraps up the last six of the isolated typologies. More and more switches, more and more efficient for more and more power. I just want to put if you see a H bridge that's not an abbreviation for the half-bridge. That's really showing that you're using a full bridge, and the H is just really how the switches look on the schematic form in H.
So we'll get in the PCB layout. Any questions so far? So reference layout, critical pass in EMI, and analogue circuitry. The reference layout is something you're going to find, if you have a microcontroller and a manufacturer that outputs those data. A lot of times a reference layout is going to be used exactly. You'll be able to copy exactly just like the manufacturer intended to. I don't get any of those. I rarely ever see any data sheets at all. I'm usually searching really hard for data sheets and application notes. One hint is, when you can't find them contact the manufacturer. They will give you information that you can't always find online. Always reference the manufacturer's data sheet and any application notes. Again, this is going to apply, if you have a manufacturer that has a controller or a critical device in there, that's going to show you how to make it work. Many times they're not available at all. We are going to talk about some reasons that the reference layout can't be copied. Very common. We wouldn't have this class right here, if all you had to do was copy a layout every time, right? We're talking about where the changes can be made and where they should not. Just some quick sample reference suggested layouts that come in all forms. Some of them are cartoonish looking, but they're always giving you something that the manufacturer knows is needed. Most often without enough explanation of why. Some of them were just demonstration circuits that they give you that, they made work for them, and may or may not even apply with your application of it. Your layout may not look anything like that but that's what you get as far as PCB layout direction. So here's some of the reasons a recommended layout cannot be implemented as is. The first one is, the major components are different in size and shape. I think every switcher I've ever laid out has a different size inductor and a different sized rectifier than what's shown in the referenced layout. And I think that's typically because the electrical engineer might be going through a cost reduction analysis, or he might be just changing parts out, so that he can use parts that are in his company's stock. That's the most common one, and it does change the layout quite a bit when the shape is different. You can no longer maybe make return paths the way that they were. Circuit functions omitted or added, mechanical restrictions, proximity to other components. All these things are going to affect, if you can implement a recommended layout as is. Test requirements would be like ICT test points - having to put vias on every signal line and the manufacturer telling you that you can't. Fine pitch parts requiring thinner copper weight? If a manufacturer says this layout has to be done with 2 ounce copper, but you have a fine pitch part that says, you have to do this with three eighth ounce copper, you're going to have to plan these current paths differently and do changes to their layout. You just want to make sure it works as well as they intended. Larger vias. Many times they'll tell you put a via here and here. If you're forced because of company standards or because of reliability concerns to use a different size via, you may not have that same availability for a placement for a via. So you might be changing the layout just to get the vias in there. And of course different number of PCB layers. That's a common one. So we hope by understanding how the switcher works and where the critical power paths are, we'll be able to change the layout so that these things don't affect the sensitive analog circuitry. Your company's design standards might even bring other changes in mind here: VM pad, thermal reliefs, footprint sizes - all these things that your company may tell you you have to use. You might be looking at a layout and it'll make it literally impossible to implement it. The most critical paths in a switch or layout always are the AC current loops. We need to identify them so we can plan them first. And like it says right there, these paths take priority over all others. So we're laying out the switcher for the AC current loops. When we can identify those, we can start laying out our switcher. The buck converters, the simple step down regulator, that's an easy one to start with. The DC current loops - input and output source - they're coming from the source and charging the positive terminal of Cin, and then that current's being returned from the negative terminal of Cin back to the source. Same as the load, the current is being sourced from the positive terminal of Cout and being returned to the negative terminal of Cout. First thing you do, you want to identify where these filter caps are in your schematic and identify them at as this. Because these connections here need to be made at the terminals of the capacitor. You want to make them with lots of vias and low impedes. The AC current loops are going to be the power switch loop and this is formed when the switch is on. So the current is flowing from the positive terminal of Cin, and through the series pass element, through the magnetic element to the positive terminal of Cout, and being returned from the negative terminal of Cout, back to the negative terminal of Cin. When the switch is off, we're recovering energy that's being stored in the magnetic element. So that current loop is a different current loop, slightly. It's being sourced from the inductor, charging the positive terminal of Cout, and being returned from the negative terminal of Cout, through the output rectifier and back to the magnetic element. There's very little information showing non-isolated-- there's very little for the PCB designer, but it's really quite simple when you start marking where the AC current loops are. Again, this is a single output, so it's quite benign looking, but when they get complex, which they do because they're tapping multiple voltages off of each of these transformers. You still want to identify the loops and they're separated in the isolated form. I'm also showing an optocoupler to get feedback back to the controller, because again, this is for safety reasons that you would have an isolated transformer. It's a higher voltage. The output of the series pass element, or switch, is called the switch node, and it's commonly called SW or SW node. It's part of the forward AC current path, and it carries the high amplitude voltage swings and all of the switching frequencies. That node in particular needs to be as short as possible. It needs to be sized so that carries the current - that's needed for the power supply - but you don't want to make it wider to compensate for a longer line. The reason is because that line and its ability to become an antennae and radiate EMI is related to its length. So, the idea with that note in particular is to make it as short as possible. In the return path, the note you really want to be aware of is the difference. The difference of the two AC loops - the supplies on the non-isolated switching power supplies. The difference being because the two loops you see overlay override the Cout, and some manufacturers say you don't have to worry about those because they consider those DC voltages, because the voltages on it all times. This is not a safe way to view this because there's other things at play here. We don't want to treat those as DC loops. They're two independent AC loops but the difference in particular needs to be a short common point low impedance connection at Cin, that is very short to be the anode of the output rectifier. It's going to be a common point ground that in switcher is going to also apply to p-ground in any thermal pads for your controllers. Here's just a sample layout of a buck converter layout. All the power components are on the same side of the board. The connections are made without vias and then the return paths are made with vias without thermal relief. The output rectifier is always placed very close to the magnetic element. Excuse me, and the return path to Cin as well. That's our switch node. That's made as small as possible. So the AC return path should match the forward paths as much as possible, and the best way to do that is with a full ground plane on layer two - right underneath your switching power supply. It's pretty much universally recommended that you have a full ground plane underneath your switching power supply, unless you're doing a one layer board. Then you really have to think about this, how are you going to get the return loop paths shortened and small. The reason for this is that the magnetic fields, when close cancel each other out. So this reduces EMI. So the switch node in particular need, because it carries the switching and the high current path, it needs to be protected and it needs to be located in a way that it's not near any other circuitry or any other switchers. This particular layout is a buck converter but there is something missing, the rectifier is on board. This is an ultra-efficient synchronous rectifier. So you don't see the rectifier but when the connections come out to the PC board, they follow the same rules as when it's outside. So that's it on the high current paths. Was there any questions on that? I'd be happy to move forward then. So the duty cycle control is what determines the output voltage, and this signal is going to carry the switching frequency. It's also considered medium current and should be protected from the AC high-power paths as much as possible. And because it's medium current and carries the switching frequency, it needs to be away from any sensitive analogue circuitry that it could affect. You might spend a lot of time working on these gate lines right after you plan your AC current loops. One form of duty control is pulse width modulation - just changes the time that the switch is on and off in variation of the input voltage. The area of each block is the same, and this just helps provide a really stable output voltage. To make the duty cycle work correctly we need some kind of feedback. I'm sorry this is duty cycle again, I'm sorry. This is a gate driver as opposed to an integrated controller, and these signals many times have to be routed as a pair and routed internally. Again, this is to contain the loop, make the loop as small as possible to reduce EMI, and also provide common mode noise rejection. This is what you're going to see when you start building switchers out of discrete components as opposed to getting controllers to do it for you. To get an accurate duty cycle we need some type of feedback from the output, either voltage or current. Many times it's voltage and many times it's done with a voltage divider - just sensing the output voltage. And then it's going to feed into an analog air-correcting amplifier. This is going to be on a controller chip. It's commonly called the FB or feedback node, and that node in particular is high impedance which means it's sensitive to noise. The other type of feedback might be a current feedback. How much current is the power supply supplying at any given time dynamically. That's done through a sense resistor and a comparator that senses the voltage drop across the known resistor. With that they can calculate how much current is going through that resistor at any time. You can see these aren't things that you're going to see an autorouter do. The net classes are of high current, yet they turn for a short period of time into the analog signal, so they have to be treated as a differential pair. Noise immunity is what you're after here and the routing of that is pretty specific, it's called a Kelvin connection. You might need to ground shield it, depending on what's around it. This would be another example of a Kelvin connection. This was the multi-phase synchronous buck converter you're going to see supplying your microprocessors, your core voltages, and such. And just real quick you can see in the middle there is two Cins, your two series pass elements, then two rectifiers, two inductors, and then two sense resistors. You can see the via's coming from the middle of them and then Cout coming back. Analog ground plane in the middle. The next slide will be the bottom side view. You can see the controller picking up the Kelvin connections from the two sense resistors and then providing the duty cycle back to the series pass element. This analog signals, the feedbacks that we're talking about, the Kelvins, and specifically, the voltage divider networks, they're analog and they need to be, not corrupted by the high current pass. For that reason, many times you have to have an analog ground plane for them to reference. Typically you're going to have a common point to tie that analog ground plane back to some point in the switcher. Cout is a common place for it but manufacturers will show you-- many times how the components laid out internally would dictate a different place for this common point. Here's another spot for it. This is the common point dictated by the manufacturer. Analog circuitry down at the bottom. S-ground stands for signal ground but in this case that is an analog ground. That's what s-ground stands for. When you identify that and a common point from s-ground to p-ground you're going to know where the high current returns are and where to stay away from. The idea, the analogue signals that are coming into the analogue area of this controller should optimally cross in at the common point. Thermals, always a big issue with switchers. Switchers are not 100% efficient, so they are loosing some power to heat, and because we make them so small, that heat is often hard to get out. This one obviously isn't too small. This is an inverter for a solar panel. So there's a lot of heat because it's outside in the sun already. We're trying to extract the heat and we have a heat sink on the backside. In reality we would like to shorten the gate and the control lines, but what we have here is we want to use the low impedance DC voltages for all the heat sinks. We want to use the Vin, the Vout, and ground. What you don't want to use is the switch node. What often happens is switch node is actually the best mechanical way to get heat out of a switcher. But that's your radiating EMI antenna that you want to reduce at all costs. Of course, another way of getting heat out is the air flow. They're tightly packed in tall components all the time. Your switcher itself is going to have tall components. It's going to have a tall inducter and tall filter caps. You may be shadowing your series pass element - your switch itself. Which is where you're trying to get the heat out of. If you're using just air flow, you really need to know the air direction. You might be rotating the switcher just for heat extraction. Another form, you see them in laptops, is thermal conduction. We make contact to the components to extract the heat. In this case, we have a backside conductive cooling element in contact and on top as well. But many times this is mechanically done. It might be done from a previous product. It might be done because the mechanic gets to do it first, but this is an example of pre-placed components. So in layout, we don't like pre-placed components because it gives us very little leeway on how we're going to lay it out. So if you're forced to do it this way, and you're forced to do the switcher to where it works well, you may end up with a placement that's far denser in certain areas than others. We got some common dos and don'ts, layout mistakes. Also, we need to be creative in coming up with solutions so we don't implement mistakes, just because we're being forced one direction with our layout. So don't. A lot of time we're given stack ups that we're forced to use. This is a flight aerospace HGI stack up. We're not going to change that and get this layout out this year. So we have to make this work for us. As you can see, the return path for AC current loop are on layer five. We have some high-speed signals on three and four. If we didn't plan this, we could be routing those signals right through our AC current loops in our switcher. Just being aware of this, is going to force you to make sure this does not happen. If you let this go, this is an easy mistake to make. Route right through it, right? What I suggest is, possibly using multiple layers and having them well stitched together. You could either bring the return path closer to the forward return, or vice versa. The advantage of bringing the forward current back down to the return current is that you're widening the copper. You do have to well stitch it together, but it increases your current capability and your ambient temperature rise is lowered. Don't place the voltage sense components where they're sensing. This is a common mistake. You'd be surprised. Here we have the high impedance feedback trace wrapping around right pass to switch node. It's going to be very difficult to get an accurate reading of what's really happening on the output of the switcher. It's going to be noise induced on that. We're basically making a big antenna for pickup. What we want to do is place them as close as possible to that feedback node. You'll see that in switchers a lot, the term ACAP, as close as possible. Then you bring the DC voltage as a traceback. That ones benign and immune to noise. Here's our current sense, our Kelvin connections. Many times I showed you a layout where the Kelvin connections must be made with vias. If at possible, we try not to make them with vias, the Kelvin connections made the same way. If vias are needed-- well, they're sensing power connections, right? So those nets, by definition, are already plane nets probably in your layout, and so they very easily could be shorted right to the plane, and not allowing you to get an accurate reading across what's happening up across our sense. So we use our CAD tool to make sure that those vias do not get shorted to the plane, where we don't want them to. There's several ways to do that. I like drawing small little circle voids. But I like to document this, so in case there's some further revision of this layout at some future point in time, these aren't just little pieces of draws that get floated around and affect other circuitry. Got to be aware of where our switching noise is in the switcher so that it doesn't affect other circuitry. We don't want it near anything sensitive and we don't want near other switchers. This case right here is a couple don'ts. We have the two inductors next to each other and they're coupling and causing-- this is a transformer now. We have noise induced from one into the other. So, that's a couple don'ts right there. What I do suggest doing is, the first thing on a layout I like to do is, having working placements of all the switchers. When you do that, you know where the switch nodes are, you know where to face them, and you know how to keep them away from anything else that's going to be sensitive. Other people may start with other circuits, but I always start with the switchers first. This one might be the worst mistake of all. Placing Cout at the load. If you're using multiple series pass elements, Cout size often decreases in size. So it becomes a small ceramic cap. And if you don't have it identified early as Cout, it could easily get mistaken for a missing bypass cap at a device somewhere else on the board. And what you've done here is you've taken away the ability to filter out the voltage ripple at the output. What happens here, simple little mistake, but you will have your voltage ripple across all your plane in between here, and you will see it on all your signals on that voltage rail. All your digital outputs will see that switching frequency on it. So what do you do with Cout? You put it right next to the magnetic element that's forming the LC filter. Switchers do give off heat, I said they aren't 100% efficient. That power loss is output as heat. So at that phase when you're first laying out your switcher and you're getting a placement you can work with, plan how you're going to get the thermal out of it. Thermal via's in the exposed pad of the controller, flooding with all your DC voltages, planning air flow direction, all these things. Thermal vias-- I've heard them defined as something being a 14 mil or larger via. Of course you can use smaller vias, sometimes you have to especially when they are in pad, but they seem to work the best for thermal extraction - a 14 mil via. So obviously knowing how these current paths are and where the analog circuitry is, going to allow us to lay out a switcher in the best possible way. Especially when we have to change how that layout is. Some of these issues that I've said, they aren't as critical. So this gets confusing because some people don't care on certain switchers. Well, these issues increase when the current goes up and when the switching frequency goes up. I guess that's what I'm saying there that, each application is unique. I have a power supply review course. It's not really appropre, but it does explain why we call AC voltage, or AC current return. I said forward AC current, which sounds wrong, because everyone thinks AC Current only goes one or it goes two different polarities - alternating current. Alternating current can also have a square waveform, but by definition, it supplies a cyclically varying voltage over time. What we know is that it's not a DC current because DC current has a uniform direction of flow and amount or voltage of electricity. So, one thing we know it's not a DC voltage. A DC voltage that's switched on and off rapidly as in a switcher, is a cyclically varying voltage over time. It's either positive or negative relative to where it was just a second ago. Regulation is necessary because the input voltages are not perfect. Today's processors working at sub-1-volt require really stable output regulation. Switchers can do that, if they're laid out correctly. It's why linear regulators are so inefficient. It's because all the loss goes to heat, they need head room. 60% efficient is common for a linear regulator. That means all that power is lost to heat. Common application would be a 12 volt regulator outputting a 5 volt output. If it's got 1 amp that it's outputting, that's 7 volt drop across it, and it's 7 watts of heat that you must extract from that. That's a pretty common application, but seven watts is killer in the wrong environment. And this is why switching power supplies are more efficient. You're turning it on and off and your output voltage is really just a voltage average. Well, for pulse with modulation, the rise and fall times are going to change. But typical frequencies are going to be-- it depends on what you're doing. Pulse with modulation happens at a very slow speed sometimes. But kilohertz, hundreds of kilohertz, it's for a high powered audio transformer but you could also get into the megahertz. It's not 10s or 100s of megahertz, but it is a hard fast switching signal that you do have to worry about the harmonics of the edges. So it's less of a rise and fall time but really about the hard edges. The switching power supply doesn't really handle that. It handles a pulse with modulation for the input voltage but there has to be an EMI filter, rectification, all that happens before the switcher. So the switcher really isn't there to take care of that. In the main power supply of a computer, they have something called power factor correcting and that helps because it's boosting up the voltage. It's like a pre-amp for the main power supply. Yeah, but switchers aren't typically just plugged into the wall. They have filtering and prepping, before they get to the voltage itself. I want to thank you all. If there's any other questions or anything else I can help with I'm more than happy. I'm going at the exhibition tomorrow - Optimum Design has a tent over there. Please feel free to stop by and talk. I'd love to talk about your layouts. Please do that. All right? Have fun with your layouts and contact me any time. Thank you all. [applause] Thank you very much.